Prof. TANG Yong from Chengdu University of Traditional Chinese Medicine (TCM) was invited to visit Institute of Intelligent Machines (IIM), Hefei Institutes of Physical Science, on April 12. 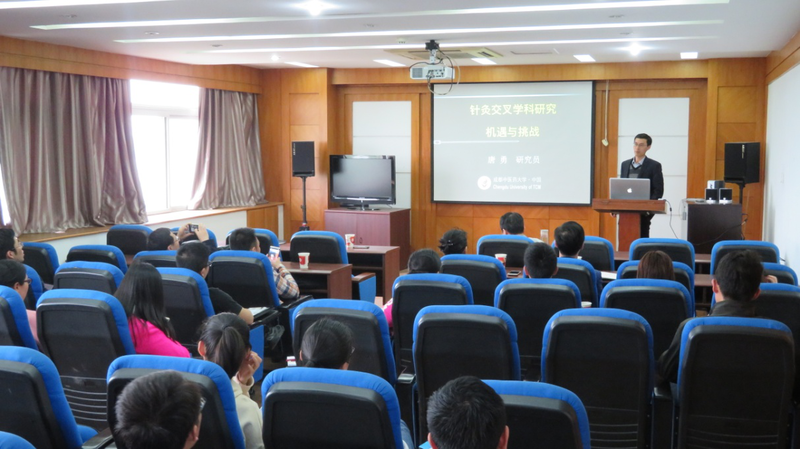 He delivered a lecture titled Study on Interdiscipline of Acupuncture: Opportunities and Challenges. He briefly illustrated the development of acupuncture and applications of acupuncture in the treatment of tumor, and then analyzed the future study of acupuncture in the interdiscipline. Grounded on the current research status and the chemical research made by Prof. YANG Liangbao's group, Prof. TANG thought a breakthrough would come, when chemistry and acupuncture was combined. In the Q&A session he answered the students' questions patiently and detailedly. Other members attending the seminar come from Anhui University of Chinese medicine and Nanjing University of Chinese Medicine. Prof. TANG Yong is the leader of Sichuan youth scientific and technological innovation research team. His research interest is mainly about acupuncture analgesia. By now, he has published more than 200 journal articles, 42 of which were included in SCI.